Yoga is about being where you are. It’s a simple practice combining conscious breathing and moving our bodies. Yoga grounds us. It brings us into the present moment focusing on the movements and breath we have here and now. It’s proven that yoga is good for our bodies, our minds and our spirits. It’s the perfect wholesome activity. It doesn’t matter where we are now, it just matters that we start. No matter what our age, body shape or fitness levels, anyone can do yoga. Yoga isn’t about fancy poses. Yoga is wherever you are. Closing our eyes and holding our hands at heart centre helps to centre ourselves, focus on our breath and the feelings in our bodies. There has been talk lately that some yogis and yoginis have changed the meaning of yoga to something more competitive or showy. Yoga is not about flexibility or doing difficult poses or posting pictures on social media. Some people find pictures of beautiful ladies in difficult yoga poses with stunning scenery inspiring, while I know others find them de-motivational. These poses and images from 10 beautiful yoginis are awe inspiring. Yoga really is for everyone. There’s many poses and classes we can do with partners or with children. There are many benefits of yoga for men too which are great to acknowledge so we can break the female stereotype. There are many men orientated yoga companies such as Brogamats as well as yoga classes tailored for men. It’s important that we don’t compare ourselves to other beautiful souls. Yoga is about strengthening the connection between our own minds, hearts and bodies. We need to practice gratitude for the place we are in now and focus on how we can improve in future. We need to look past the images of thin and flexy ladies. Many of them have spent years training and teaching yoga, spreading their love for the practice around the world. If we follow their stories, we can appreciate the time, practice and dedication it takes to get into those advanced poses. No matter what pose, yoga is all your own practice. 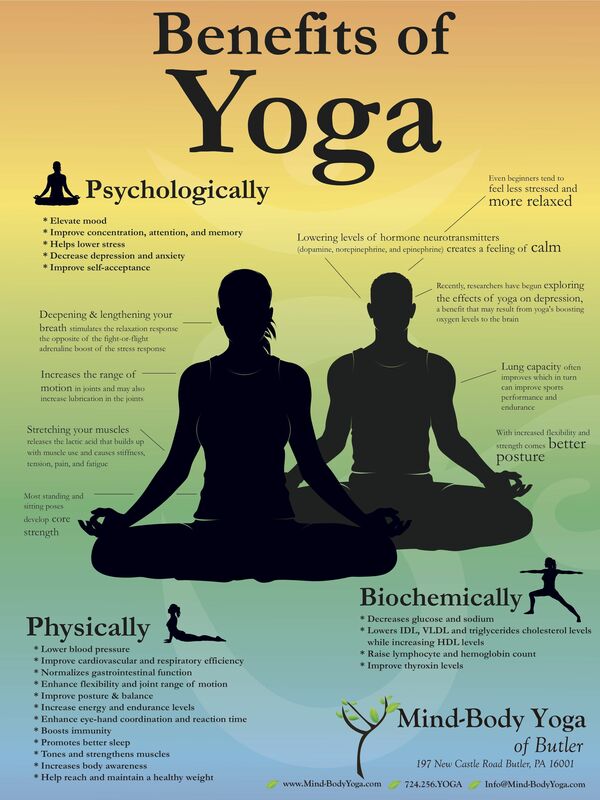 Practicing yoga improves our mind, body and soul. Yoga can have endless benefits if we use them to flow other areas of our lives. If we use yoga as a catalyst for change, positivity will only grow in our lives. It’s easy to maintain a yoga practice for a few minutes a day, then see how that impacts our lives. If it feels positive, then increase the time. Some of the many of the benefits of yoga are listed below but there are plenty more if we use yoga as a catalyst for positive change. When we practice yoga, we’re aiming to continuously be in the present moment while going through the poses. Breathing deeply helps us to relax our bodies making them easier to stretch. When we focus on our breath, we become more conscious of our thoughts, movements and feelings. Mindfulness in yoga is just one benefit and it is carried through into other areas of our lives so that we are more aware and engaged with present activities. Yoga helps to activate the parasympathetic system which returns our bodies to the relaxed and natural healing state. Many of us have stresses and anxieties in our lives. Yoga can improve how we handle tension by bringing our bodies back to a restorative state. When we integrate a practice of yoga and relaxation, our sleeping habits can improve and yoga can help cure insomnia. The majority of yoga poses can be done without props. Yoga uses our own body weight to flow through poses which work certain muscle groups. With regular yoga practice, we can improve our strength, endurance and fitness levels. Most yoga practice isn’t about aerobic exercise (cardio or the huff and puffing or sweatiness of exercise). So even though we’re working our bodies, we’re focused on keeping our breath steady and our poses strong with good form. Yoga practice can decrease our blood pressure and the impacts of heart disease. Regular yoga practice increases blood flow to the brain and can help us to voluntarily reduce heart rate which has potential therapeutic effects. Many yoga poses shape the body in a way that we’re stretching our muscles and massaging our organs. Using yoga poses to stretch and build strength helps to improve our flexibility which improves which regular practice. Our posture also improves with yoga practice as we’re more focused on the best ways to hold our bodies. Yoga can also improve lower back pain. It’s proven that mindful yoga practice improves feelings of well-being and quality of life. Yoga helps us to be aware of our impact. This organic yoga clothing brand was created through an awareness for more ethical practices in all areas of life. There are some yoga practices which can help to improve self esteem. When we hold poses in yoga, we’re constantly working on building inner strength. We can focus our attention while holding yoga poses to increase our self-awareness. We can do this by focusing on our breath, the sensations in the body and observing what thoughts and feelings arise in each pose. Gentle and mindful yoga practice improves our life satisfaction as we spend more time in a space of gratitude, appreciation and openness. Yoga can be done anywhere, at any time, in any place and at any pace. Find a time and place that suits you. There is a wealth of information about yoga available. Whether you’d like to start off at home or jump into a class, there is no doubt an option for you. There are many yoga studios in most cities and classes available at some gyms, many videos free online and countless books. The website Yoga Journal has a plethora of articles about yoga, it’s practice and impacts. If you’re looking for images to follow, they have a category of images demonstrating each yoga pose. The book The Yoga Bible is extremely helpful as it includes over 150 postures build on each other. Instead of buying one, check out a local library for more yoga books. There are countless inspirational yoga teachers to follow online and on social media – see above about Inspirational Yogis & Yoginis. There are also many yoga classes available on Youtube. One of my favourite online yoginis is Tara Stiles. She has a very soothing voice and a gentle paced practice. Tara has many classes perfect for beginners as she consistently explains how to keep form in each pose. There are classes for everything including flexibility, strength and deep sleep. Tara’s Youtube Channel has a range of videos from 5 minutes to a full practice like the 50 minute video below. I’m not a yogini or a yoga master. And I’m not qualified to teach yoga. I’m an average person who thoroughly enjoys the practice I do and yoga has changed my life. I’ve dabbled in different yoga practices for years and after committing to practiticing yoga regularly, I didn’t notice a massive difference in the beginning. I remember getting my first yoga book out from the library when I was around 14. One suggestion from the book was to try yoga naked as clothes can be restricting. A piece of advice, just wear non-restricting clothing. My mother walked in on me naked, attempting my first downward dog. So I threw in the towel for a few years. Gradually, I started doing more and more after I discovered this beginner yoga video from Tara Stiles. She’s an inspiration who is dedicated to spreading the ‘yoga rebel’ mindset that anyone can do yoga, anywhere, at any time. I stretched along with her through many of her beginner classes online. It was about this time I began to feel the power of the breath. I’ve attended a few yoga classes around Melbourne where I have witnessed people laugh and dance with joy because yoga made them feel so good. Then I found out my workplace offers weekly yoga sessions which I quickly signed up to. Having a weekly ritual made my commitment skyrocket. Because I had a weekly class to attend, I could feel the improvements in my body from week to week. I knew if I only practiced when I was in class, I wouldn’t improve very fast over time. I wanted to improve my strength as moving through a flow from down dog to Chaturanga was difficult with zero muscles in my arms (Chaturanga, itself, is simply a plank hold). Realising I’d be able to flow more easily if I had more strength, I started to do other exercises such as a push up or two. In the first week I had built up to 5 whole push ups – a true miracle! It didn’t take long to feel like I was floating after class. Each session went for an hour and we focused on breathing and stretching, and I could feel my muscle groups improving. It was at this point that I started to try to do some yoga practice every day. Some days I only do a one or two stretches, other days I take my time and try to feel every muscle in my body. My favourite poses is Warrior 2 as it makes me feel powerful, refreshed and open. I also try to do a lot of yoga twists as I know they’re good to detox the insides stimulating the digestive system and increasing flexibility. Downward dog flows are also a favourite as they are simple poses which increase blood flow and strength. Yoga has also influenced how I feed my body. As I’ve become more aware of my body, I’m more aware of the energy I put into my body too. Now I think more about what food I eat to produce the best possible performance. Yoga has helped me to be more mindful of how I move my body and how I interact with my loved ones. Focusing on being in the present can sometimes slip my mind – the past or future can hold my attention. The more I do yoga, the more I appreciate being where I am and sharing wholesomeness with others. The amazing benefits of yoga have changed my life for the better. Warrior Two position. I try to do this daily as it makes me feel wholesome. I’m always on the lookout for better or more wholesome ways of doing things so if you have any suggestions – especially suggestions relating to yoga, please let me know. If you do practice yoga, how has it impacted your life? If you don’t practice yoga, what’s holding you back? Do you use mindfulness when exercising in different ways?